It’s no secret I love bread. Some of you must have a similar love for that divine food, since the bread recipes on my site are WAY more popular than any other recipes. 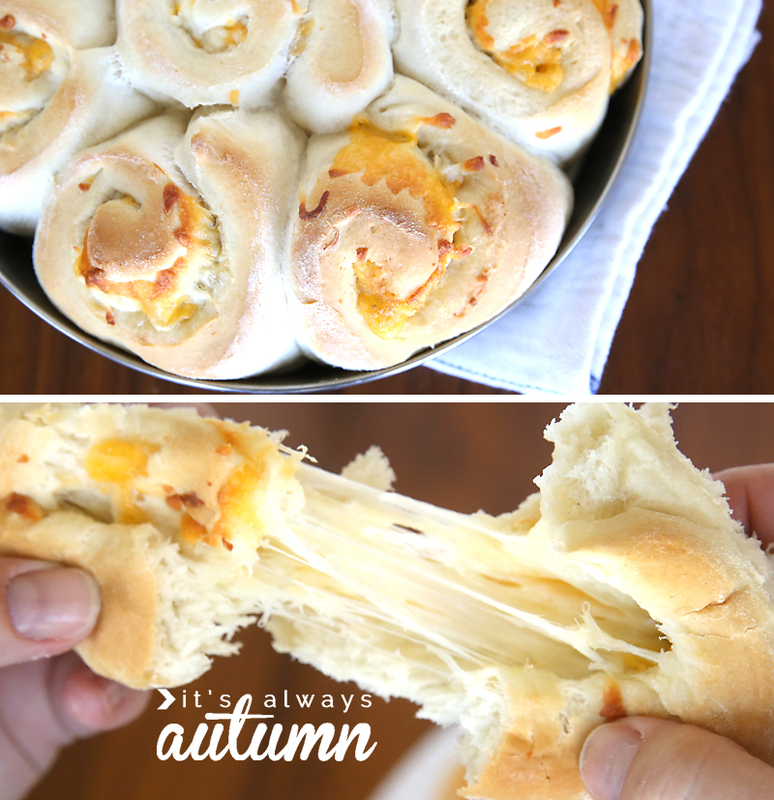 I made these easy cheesy garlic rolls to serve with tomato soup a few days ago as a quick dinner, and the kids and I thought we had died and gone to heaven. They’re made cinnamon roll style but filled with butter, cheese, and garlic instead of cinnamon. Yep. 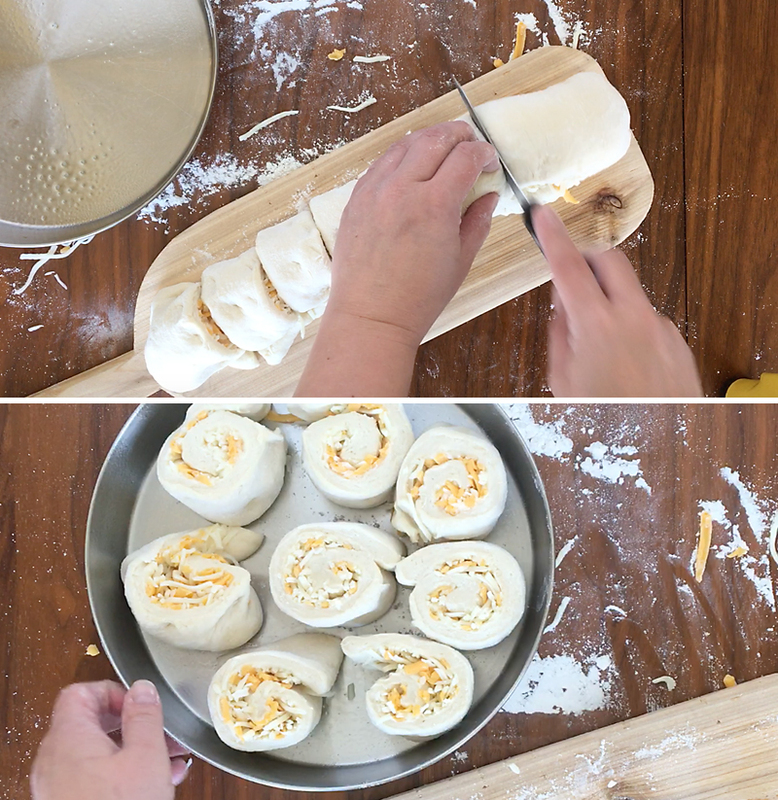 And if you aren’t sure whether you’re up to kneading dough and all that whatnot, you’re in luck, because I made these rolls using a loaf of frozen bread dough, which makes them incredible easy. 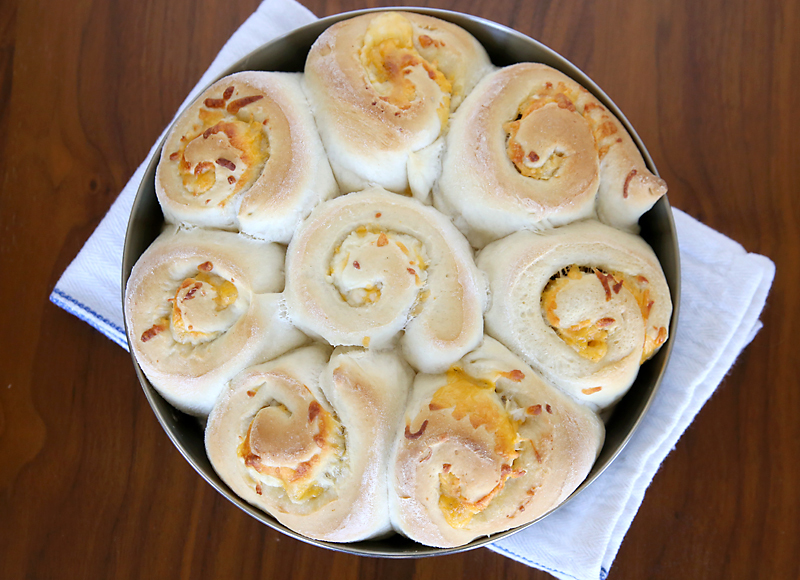 Served warm, these rolls are an absolutely amazing addition to any meal. In fact, they really make the meal. Do a little prep work an hour and a half before serving, pop them in the oven half an hour before serving, then just heat up some soup or throw together a salad and you’re good to go at dinnertime. 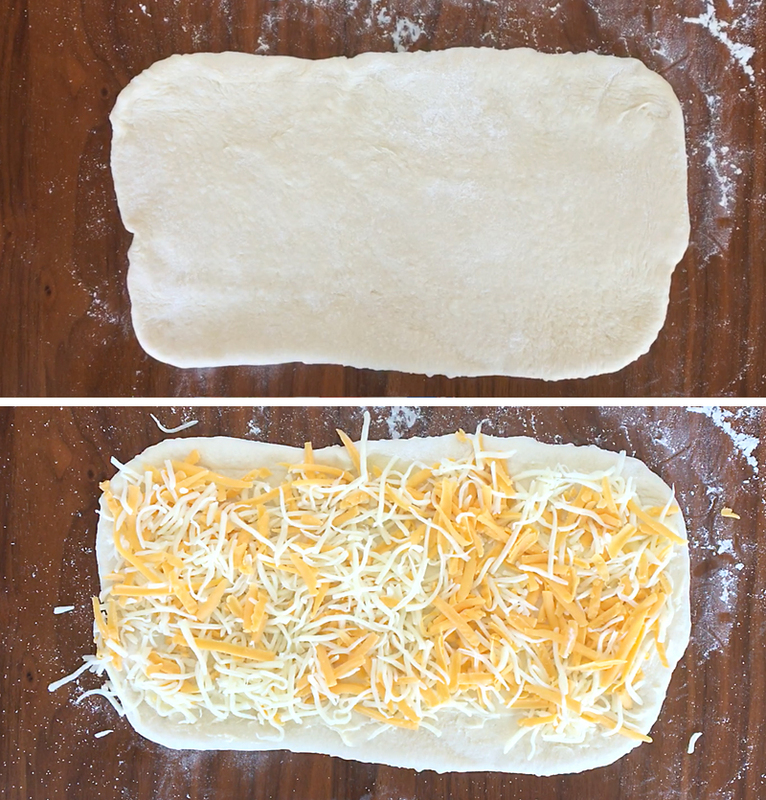 Flour your work surface and roll the dough into a rectangle shape. It will take a little coaxing; that’s ok. Just roll and stretch it until it’s rectangular. Then spread 2 tablespoons of melted butter across the dough, sprinkle with garlic salt, and top with about a cup of shredded cheese. 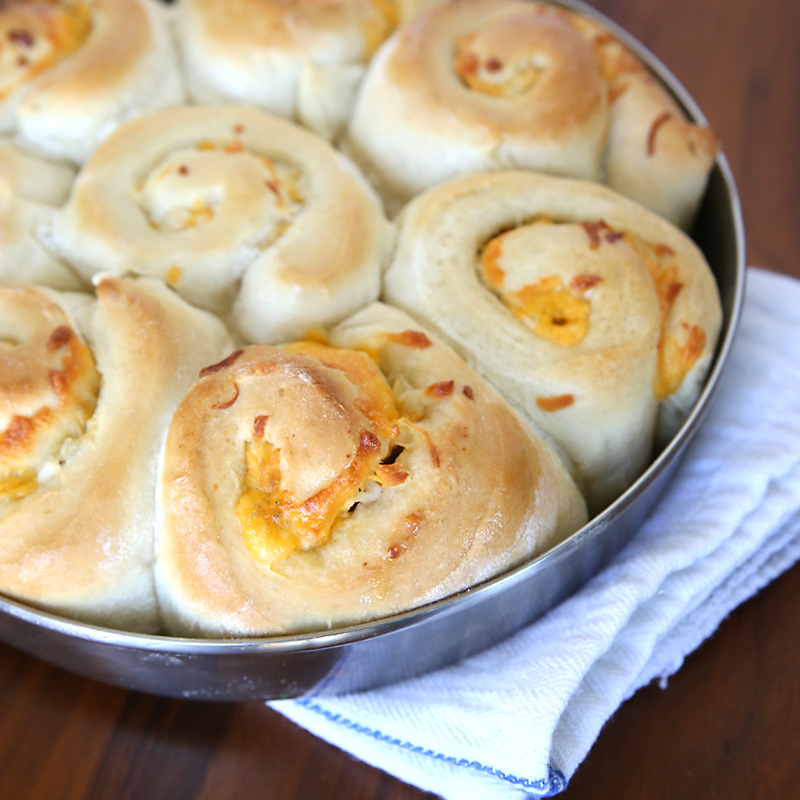 I used a mix of mozzerella and cheddar, and perhaps used a bit more than a cup, which made very cheesy rolls. At this point, roll the rectangle up into a tight log and pinch to keep it closed. Use a sharp knife to cut it into 8 pieces, and place them in greased a 8 or 9 inch circle cake pan. Cover with a towel and let rise at room temperature for 45 minutes. 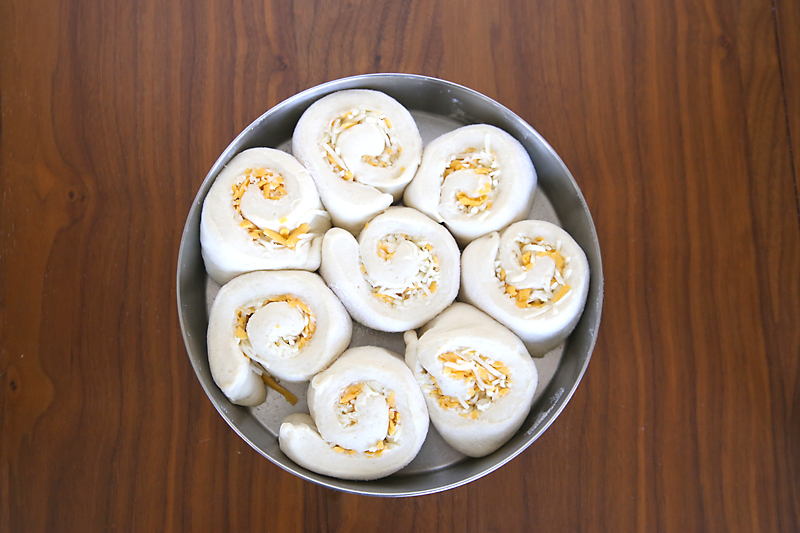 (If you’re really in a rush, you can pop them in a warm oven for half that time.) They should be getting friendly at this point. In the meantime, preheat the oven to 350 degrees. Bake the rolls for 25-30 minutes, until they have some nice browning on top. You want them AT LEAST as brown as you see in these photos, otherwise the inside will not be fully cooked. I like to let them rest just a few minutes before serving so they don’t squish when you pull them out of the pan, but definitely serve them while they are still warm for the best melty cheese experience. 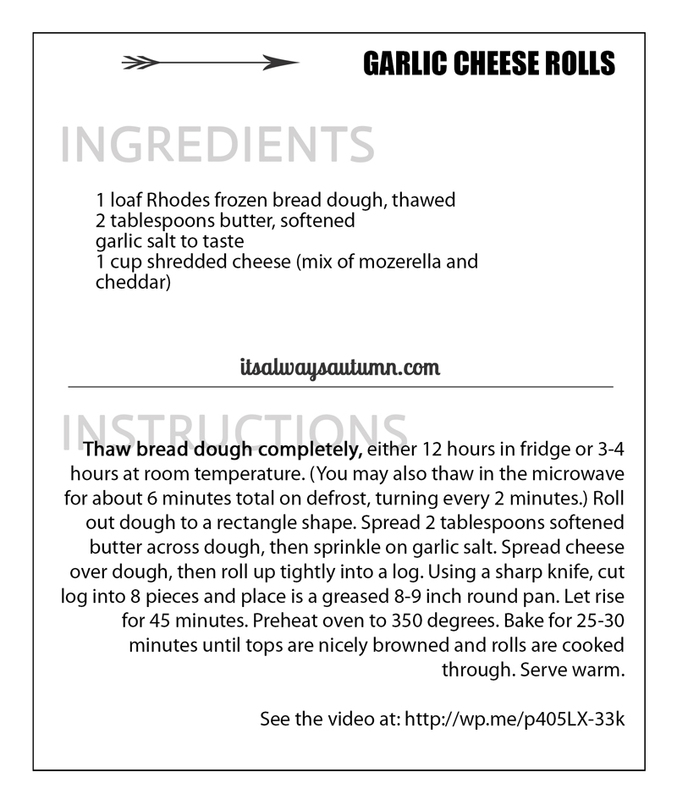 Click here for a copy of the printable recipe card seen below, and have fun in cheese bread heaven. I love bread too…in fact I have a whole Pintrest board just entitled “Bread!” haha I’m definitely feeling these rolls, but all i have on hand is a refrigerated bag of pizza dough. Do you think this would need to rise at all or should I skip that step if I use it instead for these delicious garlic delights? Wouldn’t this be even better with one of your bread doughs made from scratch? What recipe would you use?